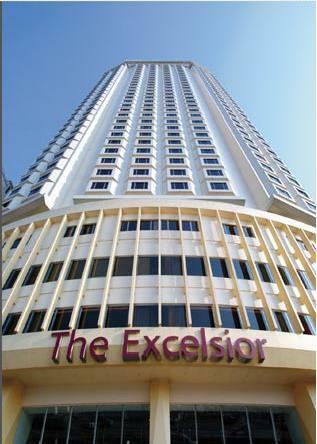 The Excelsior Hotel Hong Kong grew up together with me. This sounds exaggerating. But you will understand soon why I make this statement. The built-in planting boxes, between the columns...look so extravagant at night when all the lights are on. My dad's car drove by it countless times. After passing its main entrance, the pavement goes on an upslope leading to the loading dock of the hotel. Walking up, walking down...walking up and walking down again. I loved to do this when I was a child. How many times have I had a late night gathering with my friends in the Dicken's Bar in the basement? From the "Lounge on the 1st" you can see all the activities in the lobby. They have long opening hours. My husband (my boyfriend back then) and I had a late dinner there when he came to Hong Kong to visit in 2001. The high-end buffet served in the "Cafe on the 1st" has a nice harbor view. I have had many good times with my family and friends here. Although I have never stayed in this hotel before, it brings me many, many great memories of the good old days. Right on the harbor front, it is one of the best hotels in Hong Kong. It is about a 5-8 minute walk to the Causeway Bay MTR station. It has access to many shopping malls and places in the district, such as Sogo and Time Square Mall, also Jardine's Crescent Market, not to mention all the jewelry stores in the area. It also has the direct access to other malls, such as the World Trade Center, Hong Kong. It is just 10 minutes walk to the Hong Kong Noon Day Gun (coming soon - link to Hong Kong Noon Day Gun page), one of the British colonial legacy. Across the Noon Day Gun, it is the Victoria Park where there are many activities going on before most of the festivals, such as Mid-Autumn Festival, Christmas, Chinese New Year and more. Sounds so convenient, doesn't it? It's almost everything within your reach. BOOK a room at Excelsior Hotel Hong Kong.